Ultra-Fresh™ inhibits the growth of odor causing bacteria to prolong the life of the pad. Ultimate protection against spills and stains. Stretch-to-fit elastic skirt. TRIPLE PROTECTION. Two 100% polyester felt layers are electronically bonded to a vinyl center that insures zero liquid penetration. Machine wash, warm water. Tumble dry, low gentle cycle. Stitchless electronic quilting. No threads to break. 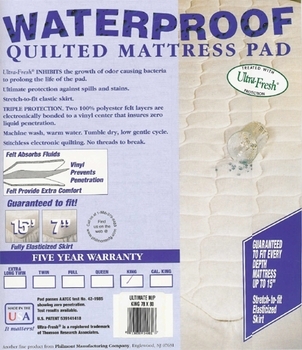 Guaranteed to fit every depth mattress up to 15".